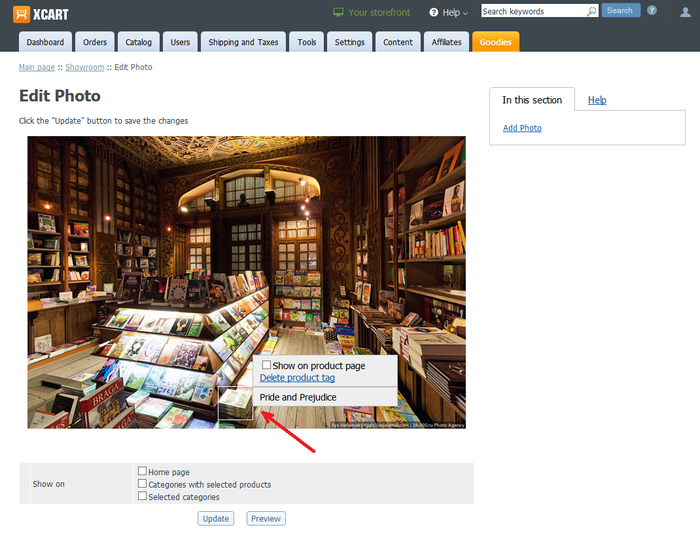 By clicking on the product name in the tooltip the user can go directly to the product page for more information about the product. Interactive banners can be inserted into any page in your store's catalog, including the home page, category pages and pages of specific products. 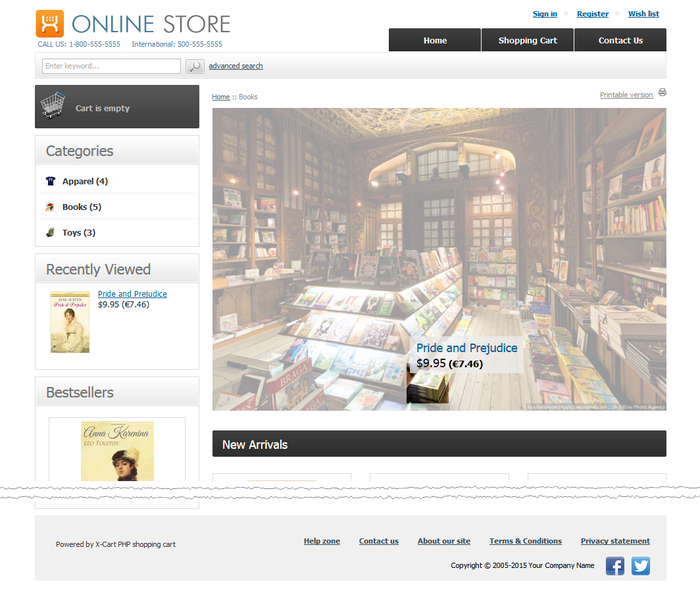 The placement of interactive banners on the storefront is in the upper part of the page below the main site menu. The interactive nature of X-Showroom banners gives an attractive look to your site and promotes greater user engagement. 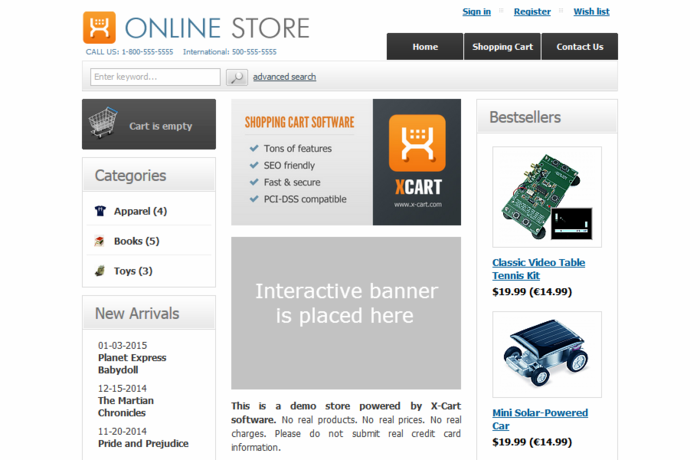 You do not need to be a webmaster or web developer: with X-Showroom, the creation and management of interactive banners does not require any tools other than your X-Cart store's Admin panel. To create an interactive banner, all you need to do is upload an image that will serve as the banner background, add some hotspots that will serve as links to your products and specify the store pages on which the banner will need to be displayed. Creating banner hotspots is point and click easy: you simply select a rectangular area on the banner image with your mouse and select a product to which this hotspot needs to be linked. You can create as many interactive banners for your store as you like and control the display parameters of specific banners via a special section in your store's Admin area. X-Showroom is available as an installable extension for X-Cart versions 4.6.6 and later. 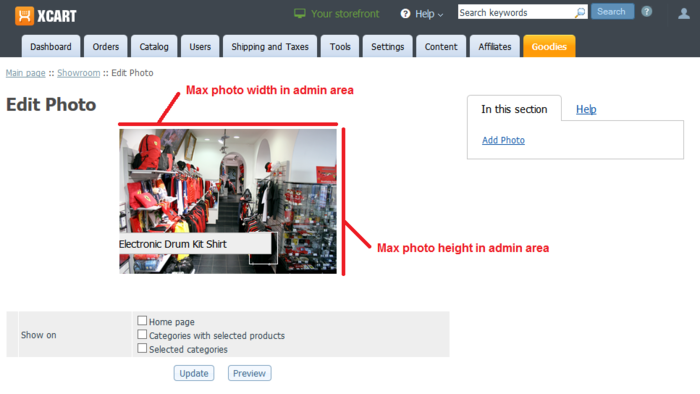 Create one or more interactive banners using the Showroom section of your store's back end. 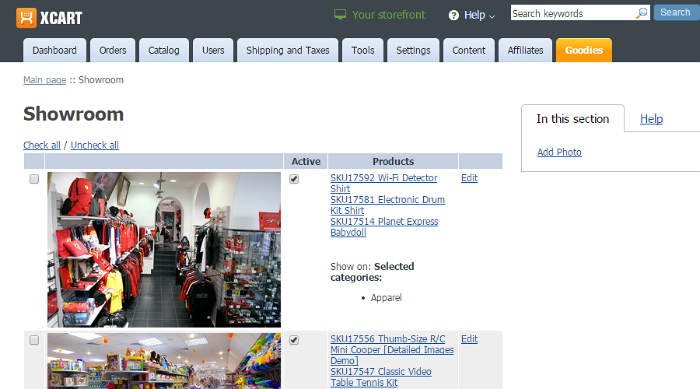 View and manage the interactive banners you have added using the Showroom section of your store's back end. To successfully install and use the X-Showroom module, you need a working copy of X-Cart version 4.6.6 or later installed on your server. 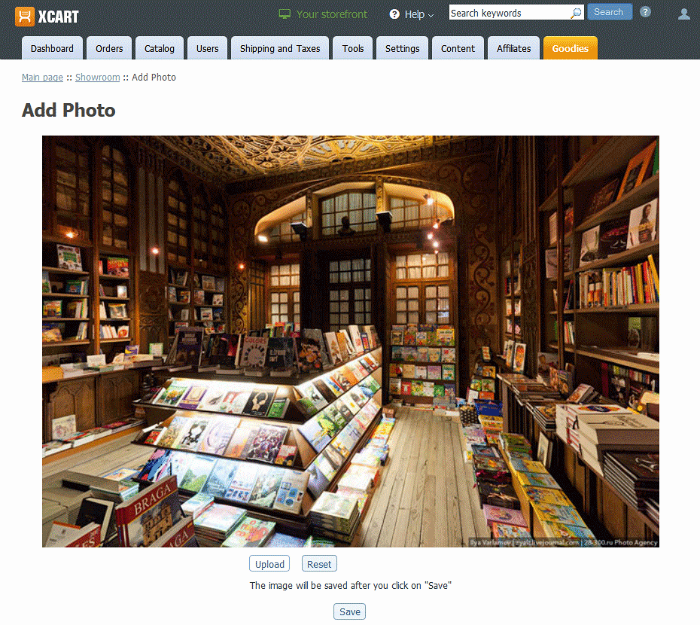 Download the X-Showroom module archive from the File Area section of your X-Cart Account. Look for a file named like xshowroom-x.y.z.tgz, where x, y and z are numbers matching the version of your installed copy of X-Cart. Copy the contents of the module achive to the X-Cart root directory on your server or hosting account. In a web browser, run the installation script httр://<YOUR_XCART_DOMAIN>/install-xshowroom.php replacing <YOUR_XCART_DOMAIN> with the actual domain name of your X-Cart store. This will start the installation wizard. Follow the wizard instructions to install the module. Once the installation has been completed, you should see the "Installation complete" screen with a link to your store's Admin back end where you can enable the installed module. 1. If you have put the module archive file in a web accessible directory, be sure to remove it to protect the module from unauthorized copying. 2. At the final step of the installation process, the installation script install-xshowroom.php is automatically renamed as an additional measure to protect the module installation. Please take note of the filename to which the installation script was renamed in your store. If you decide to re-install or uninstall the module later on, you will need to rename the installation script back to install-xshowroom.php before launching the installation process in your web browser. Uninstallation completely removes all the data related to X-Showroom module from your store. To complete the uninstallation, you will need to run the X-Showroom module installation script. You might remember that, after the module was installed in your store, the script was saved with a new name to help prevent unauthorised runs of the installer. Now, before you start, you need to rename the script back to its original name - install-xshowroom.php. Run the module installation script in your web browser by going to httр://<YOUR_XCART_DOMAIN>/install-xshowroom.php (be sure to replace the <YOUR_XCART_DOMAIN> part with the actual domain name of your X-Cart store). This will start the installation wizard. Select "Uninstall the module" and follow the wizard instructions to complete the process. Once the uninstallation has been completed, you should see the "Uninstallation complete" screen. If the module X-Showroom is installed but not active, you can enable (activate) it. Go to the Modules section of your store's Admin area (Settings -> Modules). In the list of your store's installed modules, locate the entry for X-Showroom. Select the check box on the left of the module name. The module will be enabled. It is possible to temporarily disable (deactivate) the installed X-Showroom module. Deactivation stops the module from operation, but it does not remove any settings you made to the module configuration nor clear any data that was generated during the period that the module was in operation. If you wish to completely remove all the data related to using the module, you need to uninstall it. See Uninstalling the module for more info. Unselect the check box on the left of the module name. The module will be disabled. After installation and activation, the X-Showroom module runs with the default parameters specified in its configuration settings. If you wish, you can adjust these parameters to better suit your needs; however, it is recommended to avoid using values that are too large or too small as it may negatively affect the usability of the user interface for the store administrator. In the list of your store's installed modules, locate the entry for X-Showroom and click the Configure button next to it. (The Configure button is displayed only when the module is active). Adjust the module settings as you require. 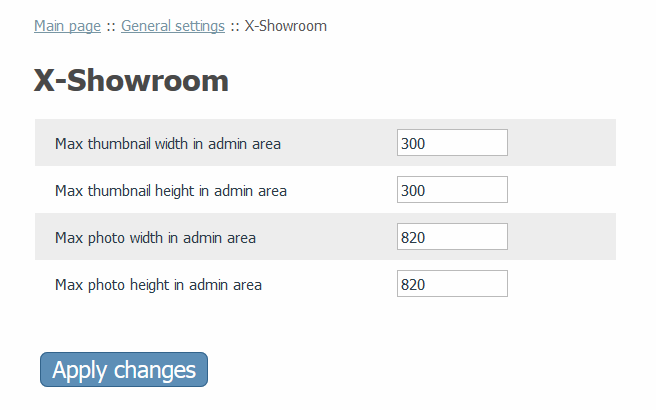 Detailed information regarding the X-Showroom module configuration settings is available below. Click the Apply changes button to save the changes. The default value for both these settings is 300 px. The default value for both these settings is 820 px. Creation and management of interactive banners is done in the Showroom section (Content -> Showroom). 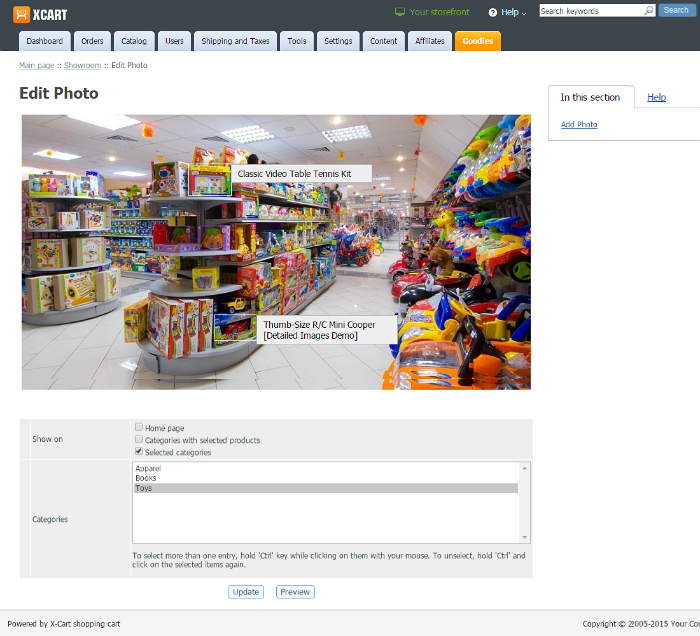 In the Showroom section menu (the area on the right-hand side of the screen titled "In this section"), select "Add Photo". Select the image file you require and click Select. File on your local computer: Use this section if the image file you require is located on the local file system of the computer on which you are currently working. 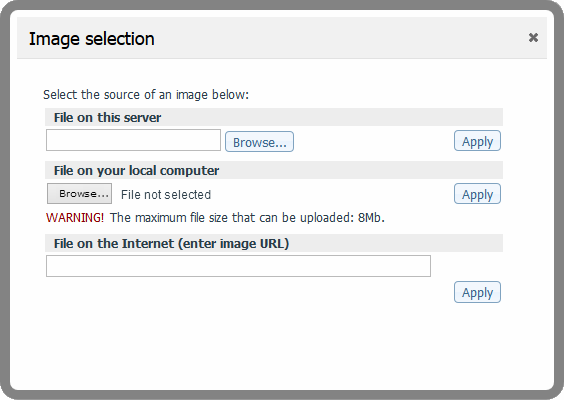 Click Browse... in the respective section of the image upload manager dialog, select the image file you require and click Open. File on the Internet: Use this section if the image file you require is located on the Internet. Enter the image URL into the appropriate field. 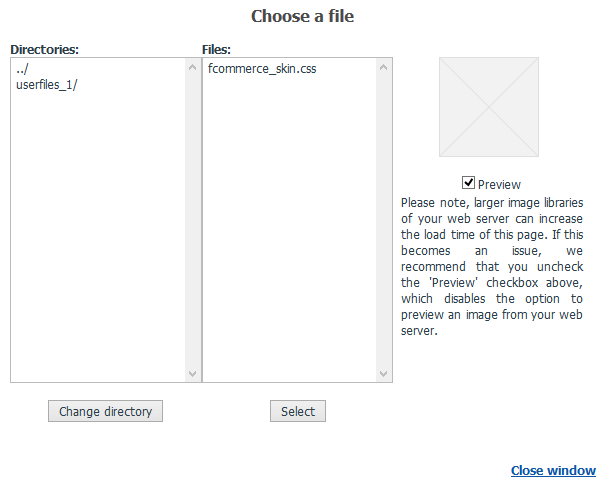 After selecting the file, click the Apply button opposite the respective section of the dialog. Click the Save button below the image preview to complete the upload. 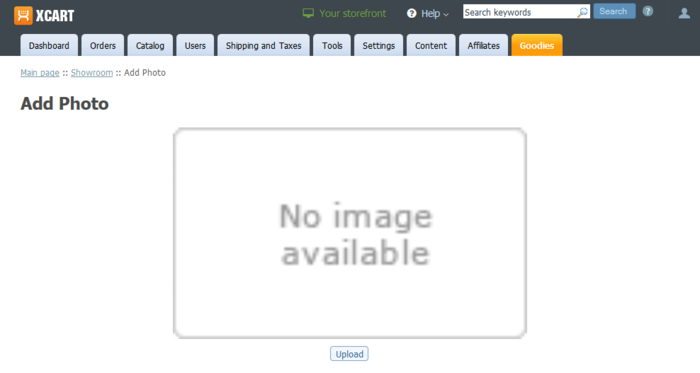 The uploaded image will appear on the page where you are creating your interactive banner. 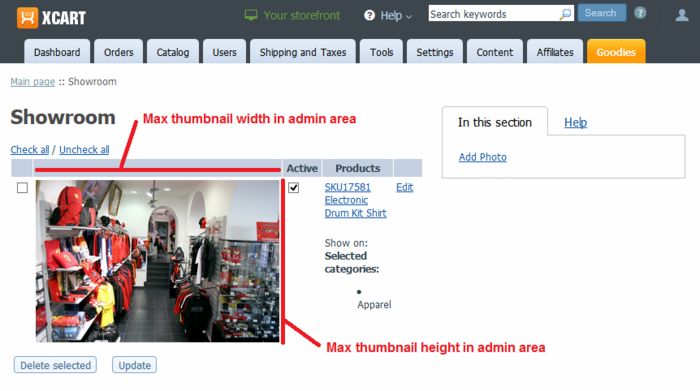 Add hotspots with links that will point from inside your banner to specific products in your store. Place the cursor over the banner image you have uploaded at the position where you want to add a hotspot. Press the left mouse button and drag the mouse in the desired direction to select the desired hotspot area. 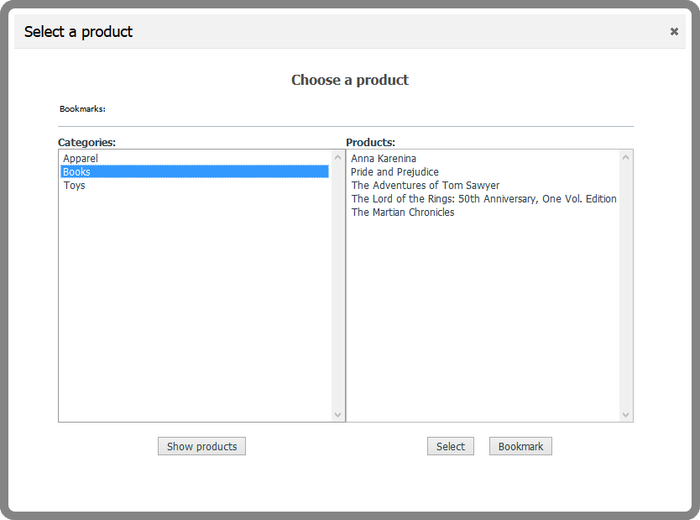 Use the "Select a product" dialog to select the product you require. The left-hand side of the dialog window displays your store's categories. 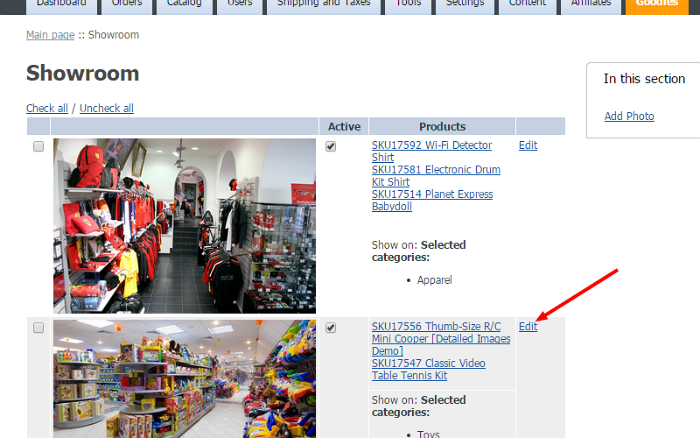 To access the list of products in a category, double click the category name or click the category name once, then click the Show products button below the category list. The list of products in the selected category appears on the right-hand side of the dialog. To select a product, double click the product name or click the product name once, then click the Select button below the product list. 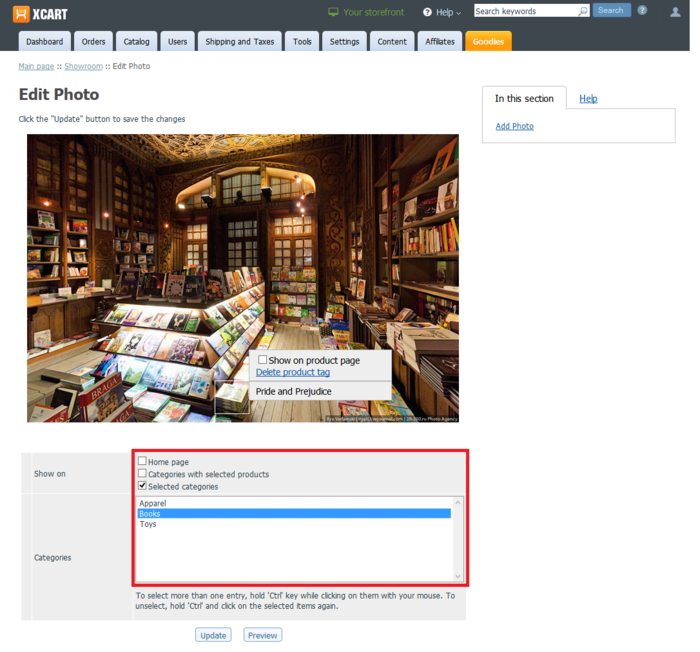 If necessary, it is possible to move a previously created hotspot over the banner image to adjust its position more precisely. To do so, place the cursor over the hotspot that needs to be moved, press the left mouse button and drag the hotspot to the desired position. It is also possible to remove a hotspot. To do so, click the Delete product tag link for this hotspot. Specify the store pages on which the banner should be displayed. 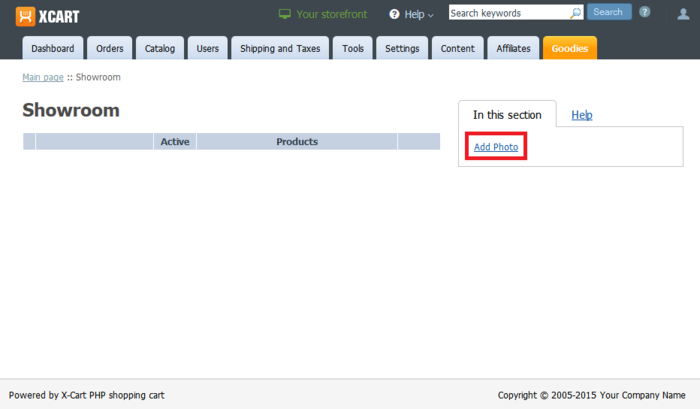 Categories with selected products: Select the check box for this option if you want the banner to be displayed on the pages of categories that are home to the products linked from the banner hotspots. To select a category, click on the category name. It is possible to select more than one category by holding down the Ctrl key while selecting categories. Once you have provided all the necessary information, save the changes by clicking the Update button at the bottom of the page. Now if you go to your store's Storefront area, you should be able to see the banner you have created. The list of previously created interactive banners can be found on the Showroom page (Content -> Showroom). 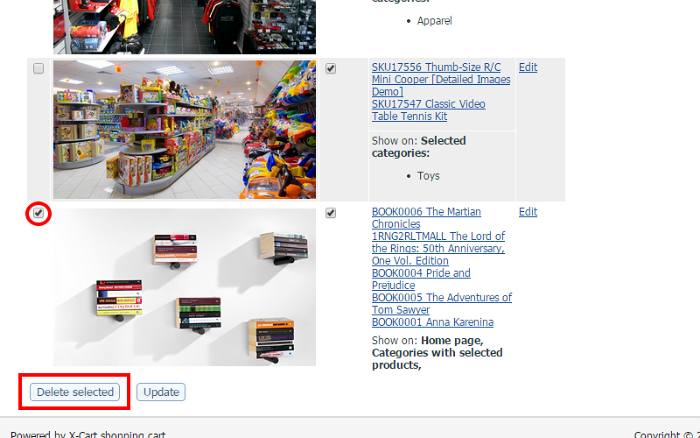 pages on which the banner is shown (See the "Show on" section in the Products column). It is possible to edit banners, disable/re-enable banners and delete banners. When you need to change a banner image, re-adjust the hotspots or change the pages on which a certain banner is displayed, you need to edit this banner. Make changes to the banner parameters as you require. Click the Update button at the bottom of the page to save the changes. The banner will be updated. It is possible to quickly disable an existing banner to hide it from any pages on which it appears. In the list of banners in the Showroom section (Content -> Showroom), locate the banner that needs to be disabled and unselect the checkbox in the Active column on the line of that banner. Click the Update button at the bottom of the banner list to save the changes. The banner will be disabled. To re-enable a previously disabled banner, select the checkbox in the Active column again and click Update. When you no longer need a certain banner, you can delete it. In the list of banners in the Showroom section (Content -> Showroom), locate the banner that needs to be deleted and select the checkbox in the first column on the left on the line of that banner. The banner will be removed. This page was last edited on 9 February 2015, at 14:40.